"Chapter Four: Power to the People"
Jericho possesses Hal Jordan. There's a big fight. Mento of the Doom Patrol declares that Jericho has absorbed pieces of the personalities he's merged with over the years and that the evil personalities are stronger and all they want is to kill. GL's will ejects Jericho from his body. The heroes defeat Jericho and send him back to S.T.A.R. Labs. Superman gives a speech to the world explaining why super-heroes should stay out of politics. Lois and Clark vote. Clark still won't tell anyone - even Lois - who he voted for or where his personal politics lie. The end. Story - 2: There is no point to this mini-series at all. The plot falls in on itself with some ridiculously contrived issue with Jericho's powers. So tell me something? If all the dominant bad personalities want to do is kill, then why not just do that? There's no explanation at all for why the urge to kill is directed toward the Presidential candidates. 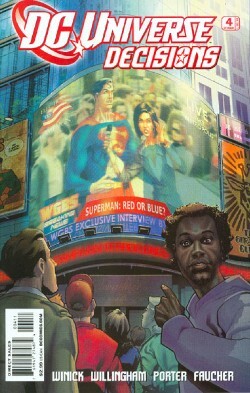 There's only one thing that makes this issue readable and that's Superman's speech. The speech is powerful and very in character for the Man of Steel. But it's totally predictable and par for Superman's course. As I said in my review of the second issue, TV's "JLU" already did this theme better with the Cadmus Arc. Even "Superman IV: The Quest for Peace" covered this material better. I suspect some readers will see it as a cop-out that Superman doesn't tell Lois in private who he voted for. I think that his silence is totally appropriate. Superman drew his political lines in the sand a long time ago. 2000, to be exact, when he stood by as the Tomorrow Party elected Lex Luthor President of the United States. So what's the story's ultimate moral? Vote. Well duh. If you're reading a comic book that deals directly with politics a week before Election Day, I should think you'd already be aware of your obligation to vote. The writers are preaching to the choir. Art - 3: This feels a little weak for someone of Howard Porter's talents - as if he decided the story was not worth the effort. And if that's what he was thinking in phoning it in, I honestly can't blame him. Cover Art - 5: This is a great looking cover, to be sure, but it also lays out exactly why DCU heroes shouldn't get involved in politics. Look to the left of the jumbo-tron: it's Superman saying "Be a Good Citizen!" As Supey makes clear in the book, he's a role model and protector without partiality. "Be a Good Citizen" is about as political as the heroes of the DCU should get - then let the people decide for themselves what that means.